Calpains are a 15-member class of calcium-activated nonlysosomal neutral proteases. They are involved in many cellular processes and are highly upregulated in pathological conditions. Some are ubiquitously expressed (CAPN1, CAPN2, CAPN4, CAPN5, CAPN7, and CAPN10), but others are thought to be localized in specific tissues. The monitoring of in vivo calpain activity is required for physiological, pathological, and therapeutic evaluations. This past decade, a tool for monitoring calpain activity in such conditions was developed using Forster resonance energy transfer (FRET). Studies showed that the level of calpain activity correlates with a decrease in FRET between the two fluorescent proteins. 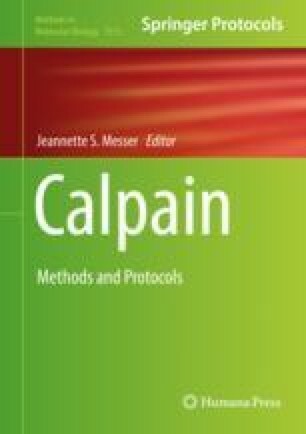 This chapter describes the methodologies from the design of the construct to the imaging procedure and analysis to evaluate ubiquitous calpain activity in vivo.